During sleep the muscles of the upper airway relax, having the effect of reducing or even completely obstructing the airways. The body reacts by increasing the force with which air is breathed in and expelled. This causes vibration of the relaxed soft tissues and generates the snoring noise. Extreme narrowing can cause complete airflow obstruction otherwise known as obstructive sleep apnoea (OSA). The blood oxygen levels reduce and the brain sends out an emergency signal causing a deep gasping breath. This can happen many times each hour and can affect your long term health and reduce your quality of life. The sleep apnoea sufferer normally is ignorant of the pauses in breathing. If OSA is not treated it can lead to serious health risks such as cardiovascular disease, raised blood pressure and diabetes. OSA can produce greatly impaired performance at work, at home, and on the road. If Obstructive Sleep Apnoea is suspected it is advisable to see a Doctor. What risk factors are there for snoring and sleep apnoea? Research has shown that approximately 40% of the adult population snore and as we get older the chances of snoring increase – 60% of men over 60 snore. There is good evidence to show that custom made mandibular repositioning devices worn in the mouth at night can greatly help reduce snoring. The appliances work by altering the position of the lower jaw such that the tongue is lifted forwards increasing the area available for air flow, thus reducing snoring. 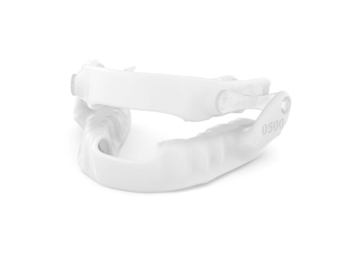 We can provide you with Resmed’s Narval anti-snoring appliance. They are custom-made to fit your teeth perfectly. If you decide to go ahead with one, we will take impressions of your upper and lower jaws and send these to the dental laboratory to make your appliance. It usually takes about 2 weeks to be made. You will then come back for a fit appointment where you will be shown how to use and care for your new appliance. Want to know more? Give us a call or ask your dentist at your next appointment.